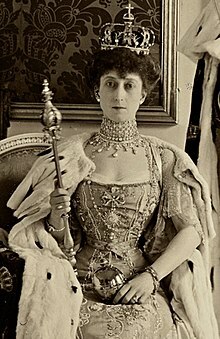 Maud of Wales, VA, CI, GCVO, GCStJ (Maud Charlotte Mary Victoria; 26 November 1869 – 20 November 1938) was Queen of Norway as spouse of King Haakon VII. She was the youngest daughter of the British king Edward VII and Alexandra of Denmark. Maud of Wales was the first queen of Norway in over five centuries who was not also queen of Denmark or Sweden. Maud was born on 26 November 1869 at Marlborough House, London. She was the third daughter and fifth child of Albert Edward, Prince of Wales, the eldest son of Queen Victoria, and Alexandra, Princess of Wales, the eldest daughter of King Christian IX of Denmark. She was christened "Maud Charlotte Mary Victoria" at Marlborough House by John Jackson, Bishop of London, on 24 December 1869. Her godparents were her paternal uncle Prince Leopold, for whom the Duke of Cambridge stood proxy; Prince Frederick William of Hesse-Kassel, for whom Prince Francis of Teck stood proxy; Count Gleichen; the Duchess of Nassau, for whom Princess Francis of Teck stood proxy; King Charles XV of Sweden, for whom Baron Hochschild, the Swedish minister, stood proxy; Princess Marie of Leiningen, for whom Princess Claudine of Teck stood proxy; her maternal aunt the Tsarevna of Russia for whom Baroness de Brunnow stood proxy; Crown Princess Louise of Denmark, for whom Madame de Bülow, the Danish Minister's wife, stood proxy; and her great-grand aunt the Duchess of Inverness. The tomboyish Maud was known as "Harry" to the royal family, after Edward VII's friend Admiral Henry Keppel, whose conduct in the Crimean War was considered particularly courageous at the time. Maud took part in almost all the annual visits to the Princess of Wales's family in Denmark and later accompanied her mother and sisters on cruises to Norway and the Mediterranean. She was a bridesmaid at the 1885 wedding of her paternal aunt Beatrice to Prince Henry of Battenberg, and at the wedding of her brother George to Mary of Teck in 1893. 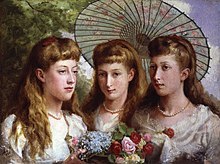 Maud, along with her sisters, Victoria and Louise, received the Imperial Order of the Crown of India from their grandmother Queen Victoria on 6 August 1887. Like her sisters, she also held the Royal Order of Victoria and Albert (First Class) and was a Dame Grand Cross of the Order of the Hospital of St. John of Jerusalem. Maud married relatively late, waiting until her late twenties to find a husband. She had initially wanted to marry a distant cousin Prince Francis of Teck, younger brother of her sister-in-law Mary. Despite being relatively impoverished from mounting gambling debts and being in a position to possibly benefit from Maud's status, he ignored her advances. 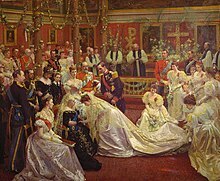 On 22 July 1896, Princess Maud married her first cousin, Prince Carl of Denmark, in the private chapel at Buckingham Palace. Prince Carl was the second son of Queen Alexandra's eldest brother, Crown Prince Frederick of Denmark, and Princess Louise of Sweden. The bride's father gave her Appleton House on the Sandringham Estate as a country residence for her frequent visits to England. 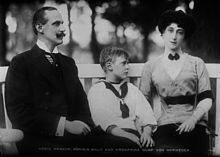 It was there that the couple's only child, Prince Alexander, was born on 2 July 1903 in Sandringham. Prince Carl was an officer in the Danish navy and he and his family lived mainly in Denmark until 1905. In June 1905 the Norwegian parliament, the Storting, dissolved Norway's 91-year-old union with Sweden and voted to offer the throne to Prince Carl. Maud's membership of the British royal house had some part in why Carl was chosen. Following a plebiscite in November, Prince Carl accepted the Norwegian throne, taking the name of Haakon VII, while his young son took the name of Olav. King Haakon VII and Queen Maud were crowned at Nidaros Cathedral in Trondheim on 22 June 1906, that being the last coronation in Scandinavia. Queen Maud never lost her love of Britain, but she quickly adapted to her new country and duties as a queen consort. Maud played a strong and dominant role within the court and family, but a discreet role in public. During her first years in Norway, she and her spouse were photographed in Norwegian folk costumes, and enjoying winter sports such as skiing, to give them a Norwegian appearance in the eyes of the public. She disliked representation but performed her role as a queen with great care, and used clothes and jewellery to make a regal impression. She supported charitable causes, particularly those associated with children and animals, and gave encouragement to musicians and artists. Among her projects was Dronningens Hjelpekomité (the Queen's Relief Committee) during World War I. She supported the feminist Katti Anker Møller's home for unwed mothers (1906), which was regarded as radical, designed furniture for the benefit of the Barnets utstilling (Children's Exhibition) in 1921, and sold photographs for charitable purposes. An avid horseback rider, Maud insisted that the stables of the royal palace in Oslo be upgraded. Queen Maud would supervise much of this project herself and was greatly inspired by the Royal Mews in London when the stables were expanded. Maud continued to regard Great Britain as her true home even after her arrival in Norway, and visited Great Britain every year. She mostly stayed at her Appleton House, Sandringham, during her visits. She did, however, also appreciate some aspects of Norway, such as the winter sports, and she supported bringing up her son as a Norwegian. She learned to ski and arranged for an English gardens at Kongsseteren, the royal lodge overlooking Oslo, and the summer residence at Bygdøy. She is described as reserved as a public person but energetic and with a taste for practical jokes as a private person. Her influence over her spouse and politics is not much examined, but she is described as a forceful and dominant person within the royal court, though her public role was less visible. Queen Maud's last public appearance in Britain was at the coronation of her nephew, George VI, in May 1937 at Westminster Abbey. She sat in the royal pew at Westminster Abbey next to her sister-in-law Queen Mary and her niece Mary, Princess Royal, as part of the official royal party. Maud also acquired a reputation for dressing with fashionable chic. An exhibition of numerous items from her elegant wardrobe was held at the Victoria and Albert Museum in 2005 and published in the catalogue Style and Splendour: Queen Maud of Norway's Wardrobe 1896–1938. Maud came to England for a visit in October 1938. Initially she stayed at Sandringham, but then moved into a hotel in London's West End. She became ill and was taken to a nursing home, where an abdominal operation was performed on 16 November 1938. King Haakon immediately travelled from Norway to her bedside. Although she survived the surgery, Maud died unexpectedly of heart failure on 20 November 1938 at the age of 68, six days before her 69th birthday (and on the 13th anniversary of her mother's death). Norwegian newspapers were allowed to break the law forbidding publication on Sundays in order to notify the Norwegian public of her death. Her body was returned to Norway on board HMS Royal Oak, the flagship of the Second Battle Squadron of the Royal Navy's Home Fleet. Her body was moved to a small church in Oslo before the burial. Queen Maud was buried in the royal mausoleum at Akershus Castle in Oslo. At her death, Queen Maud was the last surviving child of King Edward VII and Queen Alexandra. Upon her marriage, Maud was granted the use of a personal coat of arms, being those of the kingdom, with an inescutcheon of the shield of Saxony, differenced with a label argent of five points, the outer pair and centre bearing hearts gules, the inner pair crosses gules. The inescutcheon was dropped by royal warrant in 1917. Maud's great-granddaughter, Princess Märtha Louise, named her eldest daughter after the queen. Queen Maud Land and Queen Maud Mountains in Antarctica; Queen Maud Secondary School in Hong Kong; and Queen Maud Gulf in Nunavut, Canada, are named after Maud. The ship Maud, designed to the specifications of Roald Amundsen for service in the Arctic Ocean and launched in 1916 to traverse and explore the Northeast Passage, was christened in honor of Maud of Wales. The replenishment ship HNoMS Maud of the Royal Norwegian Navy has also been named for her. The Queen Maud fromage is named after her. ^ "Prince and Princess Henry of Battenberg with their bridesmaids and others on their wedding day". National Portrait Gallery. Retrieved 9 July 2013. ^ "The Duke and Duchess of York and Bridesmaids". National Portrait Gallery, London. ^ "The Queen Sonja Art Stable". www.kongehuset.no (in Norwegian). Retrieved 2018-05-23. ^ a b c d "Statue of Queen Maud unveiled by HM King Harald". Norway. Retrieved 9 July 2013. ^ "The Queen Mother in pictures". Telegraph. Retrieved 9 July 2013. ^ "Queen Maud Undergoes Operation". The Courier-Mail. Brisbane: National Library of Australia. 17 November 1938. p. 7. Retrieved 25 December 2011. ^ "Death of Queen". The Courier-Mail. Brisbane: National Library of Australia. 21 November 1938. p. 1. Retrieved 25 December 2011. ^ "Death of Queen Maud". The Sydney Morning Herald. National Library of Australia. 22 November 1938. p. 11. Retrieved 25 December 2011. ^ Dahlmann, L. A. "The secret journey of Queen Maud's coffin | norwegianhistory.no". Retrieved 2019-02-07. ^ "Supplement to the London Gazette" (PDF). The London Gazette. 22 May 1902. ^ "The Glasgow Herald". The Glasgow Herald. 27 July 1896. ^ "Norwegian Navy train at Raleigh". royalnavy.mod.uk. 8 September 2017. Retrieved 22 June 2018. Hibbert, Christopher (2007). Edward VII: The Last Victorian King. London, UL: Palgrave Macmillan. ISBN 978-1-4039-8377-0. King, Greg (2007). Twilight of Splendor: The Court of Queen Victora During her Diamond Jubilee. New Jersey: John Wiley & Sons, Inc. ISBN 978-0-470-04439-1. Wikimedia Commons has media related to Queen Maud of Norway. "Style & Splendor – Who was Queen Maud of Norway?". Victoria and Albert Museum. Retrieved 2007-06-04.